In the series premiere, the enigmatic Souma Sumire poses a hypothetical question: suppose there’s an android among us, indistinguishable in all ways from an ordinary human. Who do you think it would be? Asai Kei initially dismisses it as a meaningless proposition, saying none of them are androids, but Souma encourages him to keep it in the back of his mind. Coming up with an answer will be their summer group assignment, and a reason for the three of them to continue meeting up. The third member of the trio—Haruki Misora—remains silent for the entirety of the conversation. She is a girl of very few words, only speaking when necessary and coming off as almost robotic whenever she does. A few minutes later, we see Haruki pass by a crying girl, attempt to reset, and then begin to walk off unfazed when she realizes she doesn’t have a save point. She stops to help only when the girl herself reaches out to ask. Based on this stark display of apparent emotionlessness, one might at first conclude that Haruki is the intended android. However, we soon learn the reason for this—she acts strictly in accordance to a set of three self-imposed rules, created as a child to protect herself from an overwhelming, paralyzing degree of empathy. So long as she follows them, she doesn’t have to expose herself to all the pain and sorrow in the world. Kei likens her rules to Asimov’s Three Laws of Robotics, though noting that they diverge at the third point—where the true heart of Haruki’s actions lies. Her self-defined purpose, the foundation upon which all her decisions are made, is a sincere desire to erase others’ sadness from the world, and that proves her humanity. So our first candidate for android is out of the running, but the implications of Souma’s question still linger. If the proposed “android” is indistinguishable from a human, how do you make that distinction? Where do you draw the line? And what does it mean to be on one side or the other? The end of the first episode provides a look at a potential answer—in the form of the girl Haruki nearly snubbed earlier. Her name is Kurakawa Mari, and she was created seven years ago by her mother’s special ability, manifested when the “real” Mari was born stillborn. This replacement Mari grew up like any other child, save for the method by which she came into the world. She’s indistinguishable from a human—exactly like Souma’s theoretical android. For three years, Mari’s mother raised her as her own, but then her husband ran off and she slowly stopped being able to accept Mari as her genuine child. And four years later, she became entirely unable to bear the weight of what she had created, finally deciding to leave Sakurada at the Bureau’s recommendation. Once you step outside the city’s borders, you lose your memory of everything related to the powers within, allowing her to leave it all behind her, and the Bureau—an administrative organization in Sakurada that oversees all matters supernatural—to keep a potentially troublesome ability under wraps. After Haruki allows Mari to be taken into custody by an agent of the Bureau, Kei challenges her. You got us involved, so you make the decision—are you really okay with just standing idly by as this seven-year-old child loses her mother, her only family? Or do you want to do something about it? Haruki concedes that she does want to help, so they reset, and using Kei’s ability to preserve his memory, set off to prevent Mari’s mother from leaving before it’s too late. In order to pull off his plan, Kei enlists the help of Nakano Tomoki, who has the ability to project his or someone else’s voice directly into another person’s mind, and Sakagami Yousuke, who can allow one person to share another’s ability. He sends Haruki and Tomoki to the hospital where Mari waits, bringing Souma and Sakagami with him to confront Mari’s mother and try to convince her to stay. Mari’s mother is certain she’s only hurting Mari by being around. She can’t properly love Mari because she can never forget about the baby who didn’t survive. It would be cruel to remain with a child she can’t sincerely love. But Kei contends it would be crueler to leave Mari behind. He asks her to think about the situation from her daughter’s perspective. What if she had died and Mari created a clone of her instead? Would she not wish her own child to have that happiness just because it wasn’t the “real” her? Did that invalidate her love? Did it disqualify her from having someone to love? Mari’s mother still isn’t fully convinced, so Kei uses Sakagami’s power to share his perfect memory with her, allowing her to recall precisely how she felt when Mari was born. Whether that love was real or not. Then, as she’s reeling from the flood of faded emotions, Tomoki delivers Mari’s words directly to her from the hospital. 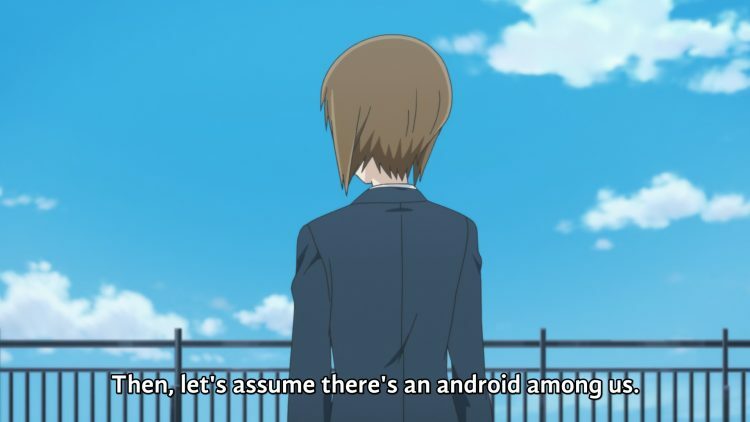 Mari may be an “android,” but Sagrada Reset declares that, ultimately, it’s irrelevant. She’s just as real as the rest of us. The love she feels for her mother is real, and the love her mother felt for her was real too. And that’s all that really matters—not how she came into the world. Mari’s mother is allowed to both grieve for the Mari who didn’t make it while also loving the Mari who did. And when it’s all over and Souma presses Kei for an answer to her hypothetical question, he sticks with his original response: no one, they’re all human. But Souma won’t take that for an answer, so he flips it around. If an android is an artificial being, in the sense that it was formed by human hands, then we’re all androids. The question of what it means to be human sits at the very heart of Sagrada Reset. Where does the line fall between “human” and “android”? How important even is the distinction? It’s a question woven into the fabric of the series, and one you’ll see manifesting again and again in different forms as the show progresses.